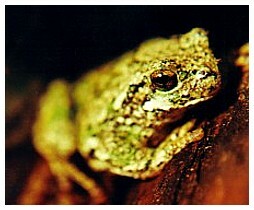 This Gray tree frog was my pet. I had him for a long time but then he past away. But I'll have these pictures to look at now. 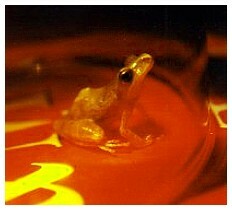 This is an image of a tiny frog I found when I was camping up north. He was the size of a dime in hight and length. Here he is sitting on a magazine so you can see by comparing the text how small he is. Click on "more frog photos" to see more of these two frogs.